For those looking for the ultimate statement in outdoor decor, the Monteros Fountain is a three-tiered centerpiece made to draw about the epitome of distinction and sophistication. The cast-stone Monteros Fountain in Basin weighs 3559 pounds and displays a never-ending cascade of water for all to see. Ships via LTL Freight Carrier for free standard curbside delivery. All Campania International pieces are stained to order. This process takes 10-14 business days to complete and to prepare for safe shipment. 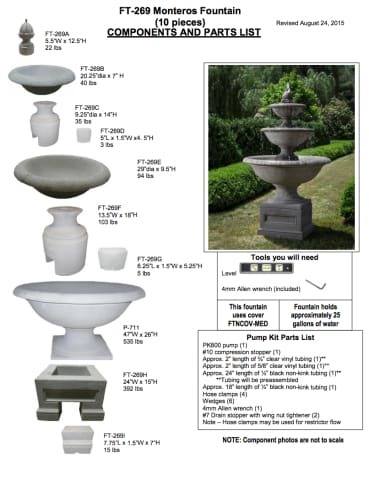 Order the Campania International Monteros Fountain with free curbside delivery to your home from TheGardenGates.com today.